SUNLIT UPLANDS: Let Freedom Ring! 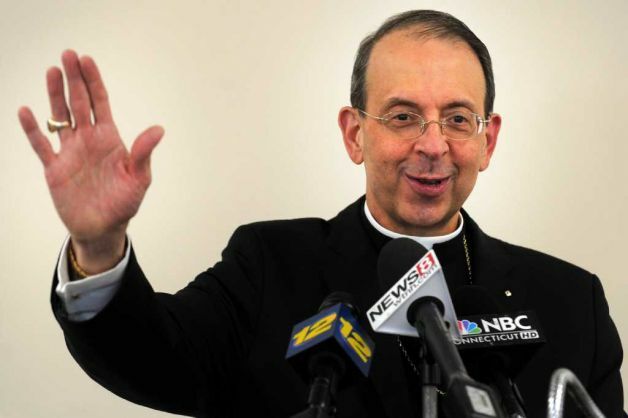 Archbishop Lori delivers an address on the Obama administration's assault on religious liberty. The Archbishop of Baltimore, William Lori, chairman of the U.S. Conference of Catholic Bishops' Ad Hoc Committee for Religious Liberty, delivered the keynote address at the Ethics and Public Policy Center’s National Religious Freedom Gala Reception and Award Dinner in Washington May 24. It has now been just over a week since I became the archbishop of Baltimore, and I find myself surrounded by history there. I live near the Basilica of the Assumption, the oldest cathedral in the U.S. The cornerstone was laid in 1806. The nation’s first bishop, John Carroll, is buried beneath the basilica, as are many of my predecessors. John Carroll was a cousin of Charles Carroll, a signer of the Declaration of Independence. Charles Carroll’s story — and indeed Maryland’s early history — teaches us about the fragility of religious liberty and the importance of exercising vigilance in protecting it. Maryland was founded in the mid-17th century by the Catholic Lord Baltimore as a society where people of different faiths could live together peacefully. This vision was soon codified in Maryland’s 1649 Act Concerning Religion (also called the “Toleration Act”), which was the first law in our nation’s history to protect an individual’s right to freedom of conscience. Maryland’s experiment in religious toleration, however, ended within a few decades. Around the turn of the 18th century, the colony was placed under royal control, and the Church of England became the established religion. Discriminatory laws, including the loss of political rights, were enacted against those who refused to conform. Catholic chapels were closed, and Catholics were restricted to practicing their faith in their homes. The Catholic community lived under these conditions until the American Revolution. Both Charles Carroll and his father, although wealthy landowners, were barred from active participation in politics because of their Roman Catholic faith. Despite this legal restriction, in the early 1770s, Charles Carroll became a powerful voice for independence from British rule. He eventually was elected to represent the colony of Maryland in various committees and was selected as a delegate to the Continental Congress in 1776. Carroll then signed the Declaration of Independence and was the only Catholic to do so. Just a few years later, our Founding Fathers included protection of the free exercise of religion in the First Amendment to our Constitution. In reflecting on his time in the Constitutional Convention, George Washington stated in 1789: “If I could have entertained the slightest apprehension that the Constitution framed in the Convention, where I had the honor to preside, might possibly endanger the religious rights of any ecclesiastical society, certainly I would never have placed my signature to it” [Letter to the United Baptist churches in Virginia, 1789]. Washington went on to state, “[I]f I could now conceive that the general government might ever be so administered as to render the liberty of conscience insecure, I beg you will be persuaded that no one would be more zealous than myself to establish effectual barriers against the horrors of spiritual tyranny and every species of religious persecution” [Ibid.]. Twenty years later, in 1809, another of our Founding Fathers, Thomas Jefferson, emphasized the value of freedom of conscience when he stated that “no provision in our Constitution ought to be dearer to man than that which protects the rights of conscience against the enterprises of the civil authority” [Letter to New London Methodist, 1809]. Thus, we can be confident that our Founding Fathers understood the foundational value of religious liberty and freedom of conscience. But today, we are reminded of the lesson of Maryland’s early history and the story of Charles Carroll, because that value is under attack, and it will require our active vigilance to protect it — not just for ourselves, but for future generations. Pope Benedict XVI recognized and highlighted this threat in his address to a group of Catholic bishops from the Mid-Atlantic region earlier this year. That was on Jan. 19 of this year. On Jan. 20, as if on cue, the Department of Health and Human Services announced that it had no intention of changing the mandate it had proposed in August, which would force virtually all employers — even those with conscientious objections — to provide health coverage for contraceptives, sterilization and abortion-inducing drugs. The mandate would be subject to an extremely narrow exception, one that covers houses of worship, but leaves out the manifold ministries of charity that flow directly from that worship. This has now become the most critical religious-liberty challenge that we face in the United States today. This is the first time that the federal government has compelled religious institutions to facilitate and fund a product contrary to their moral teaching. Compounding the problem, the exemption has the federal government defining which religious institutions are “religious enough” to merit protection of their religious liberty. For these reasons, a great number of Catholic dioceses, charities, universities and other Catholic institutions around the country found it necessary to file lawsuits this week against the federal government, challenging the mandate as a violation of the First Amendment and the Religious Freedom Restoration Act. It is unfortunate — even tragic — that Catholic institutions and other religious groups were forced by the federal government into this situation. Part of the tragedy is how easily, and on how many different occasions, this conflict could have been avoided entirely. Despite the best efforts of our bishops’ conference, the executive and legislative branches have failed to head off the problem. For example, back in 2010, before the health-care-reform law was even passed, Catholic bishops warned Congress about the need for clear conscience protection in the face of the new health-coverage mandates in the law. Soon after the bill became law, the bishops’ conference supported the passage of the Respect for Rights of Conscience Act, which offered a complete solution to the conscience problem, drawing on language used in federal statutes repeatedly since 1973. Once the administration began hinting that the “preventive services” mandate would include things that Church institutions could not morally facilitate or fund, the conference staff began filing comments and appearing at hearings, as early as fall 2010. Once the regulations finally came out in August 2011, we filed more comments. When the decision was announced that those August regulations would not change, we protested again. Despite these numerous opportunities to avoid the train wreck, on Feb. 10, HHS finalized the August regulations “without change,” closing the door on any chance of removing the offending items from the mandate or expanding the exemption. All that remains is the so-called "accommodation,” which is constrained by the final rule that precedes it and which addresses itself to only a small part of the overall problem, and does so inadequately. Catholic institutions have thus been forced to take action by litigation, a course no one desires, but a course that appears to be the only alternative left in order to seek relief from this unjust federal government mandate. This is not about the Catholic Church wanting to force anybody to do anything; it is instead about the federal government forcing the Church — consisting of its faithful and all but a few of its institutions — to act against Church teachings. This is not a Republican or Democratic, a conservative or liberal issue; it is an American issue. The Church forms its positions based on principles — here, religious liberty for all and the life and dignity of every human person — not polls, personalities or political parties. Now I’ve said what this litigation is not about. So what is it about? For starters, it is about opposing an unwarranted government definition of religion. The mandate includes an extremely narrow definition of what HHS deems a “religious employer” deserving exemption — employers who, among other things, must hire and serve primarily those of their own faith. This exemption attacks religious freedom by defining it away — by limiting protections essentially to houses of worship, the exemption reduces the freedom of religion to the freedom of worship. But more importantly, the purpose of the litigation is to block government coercion to act against conscience. Those deemed by HHS not to be “religious employers” will be forced by government to violate their own teachings within their very own institutions. This is not only an injustice in itself, but it also undermines the effective proclamation of those teachings to the faithful and to the world. I emphasize the fact of government coercion because it is one of the key differences between a mere dispute over reproductive health policy and a dispute over religious freedom. Those who would try to conceal that religious-freedom aspect have done all in their power to conceal the key fact that the Church is being forced by the government to violate its own beliefs. In a bizarre turn, those same advocates accuse the Church of somehow forcing its beliefs on others through the law, when the exact opposite is true. To be sure, the mandate entails a breach in the separation of church and state, but it is an incursion by the state into the Church’s territory, not the other way around. This is not the only strange inversion that we have seen in public discourse since the mandate. In the name of protecting “choice,” the government is depriving the Church of its choice in how it runs its very own institutions. In the name of protecting a “diversity” of views within Catholic institutions, the government is imposing uniformity on employers, all but eliminating workplaces ordered according to Catholic values. Worse still, these radical distortions seem to have some sway in our culture, when they should be laughed out of the court of public opinion. This underscores the depth of the problem we face and points to the long-term remedy for it, which is teaching about religious freedom — the very value that brings us all here tonight. Put in other words, the HHS lawsuits, if successful, would only provide a band-aid solution to the greater problem of radical secularism that we face in this country. Blessed Pope John Paul II discussed this problem almost two decades ago when he visited Baltimore and stated, “The challenge facing you, dear friends, is to increase people’s awareness of the importance for society of religious freedom; to defend that freedom against those who would take religion out of the public domain and establish secularism as America’s official faith. So how do we pass on our great legacy of religious freedom to the next generation? As Americans, we must learn about the legacy of the Founding Fathers of the United States. As people of faith, we must mine our own religious traditions on religious freedom and share the treasures we find — not only with our own communities, but with society at large. And then we need to pray diligently as communities, as families and as individuals for religious liberty. With this in mind, the U.S. bishops’ Ad Hoc Committee on Religious Liberty has suggested that we celebrate a “Fortnight for Freedom” this summer, from June 21 to July 4. This is to be a special period of prayer in the two weeks leading up to the Fourth of July. In the Catholic tradition, these two weeks include the feast days of members of the Church who were martyred by the state for their religious beliefs, beginning with St. Thomas More and St. John Fisher. But regardless of your tradition, and what may otherwise fall within those two weeks, we invite you to join us in prayer and in a great national campaign of teaching and witness for religious liberty. This may take as many forms as there are great religious traditions in our country and will itself serve as a sign of the religious diversity that flows from religious freedom and that makes our country great. But the possibilities are endless, including prayer services for religious liberty within your own tradition and ecumenical events to show the breadth of support for this foundational value — to name just two. The key point is this: U.S. bishops and faithful Catholics in this country, numerous though we may be, cannot fight the tide of radical secularism alone. And so we ask you to help however you might help. Together we can achieve great things. Although fighting the tide of secularism in general and current threats to religious liberty in particular can seem like a daunting task, we know that with God all things are possible; and we know that prayer is the ultimate source of our strength in this fight. Thank you so much for this honor this evening. And thank you for seeing the urgency of defending religious liberty for all believers. Thanks for listening, and may God bless our nation!